Chasing the Green Fairy: Absinthe makes the heart (and head) grow fonder. The only evidence of fairies that I can offer involves a childhood exchange of teeth for cash. Monetary value aside, the hunt for the “Green Fairy” (aka absinthe) is entertainment for your mind and body. 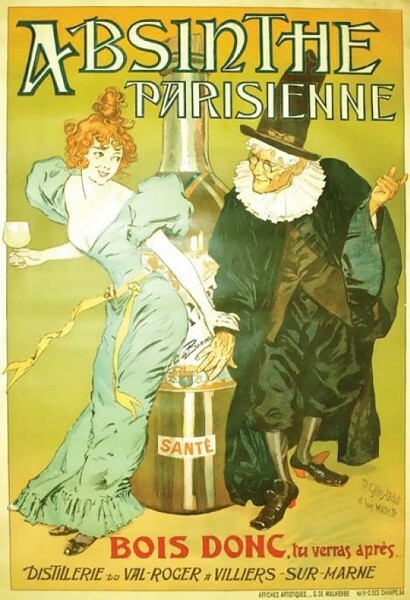 Absinthe is an anise-flavored, bitter liquor made by steeping fennel, wormwood, anise and other herbs in a neutral spirit. It is then redistilled to a fierce 120-160 proof. A secondary steeping in herbs extracts chlorophyll, which gives it its signature green hue. A glowing emerald color can only be achieved by adding solvents, a gimmick used by some producers to reinforce the purported mystical properties of this spirit. Originally concocted more than 200 years ago as an elixir, it was quickly discovered to deliver quite the buzz. Due to its inherently bitter quality and paint-stripping high octane, a more socially acceptable and drinkable version was embraced. The ritual serving of absinthe had a panache and allure that swept through France in the late part of the 19th century. There were even Green Hours at cafes dedicated to the serving of absinthe—a (very) happy hour of sorts. Absinthe’s inherent fiery quality and bitterness is tamed by the addition of iced water and sugar. A sugar cube placed in an ornamental, slotted spoon is set atop a glass of absinthe. Iced water is then slowly poured over the cube; a ratio of four parts water to one part firewater is recommended for mere mortals. The distilled botanicals are insoluble and separate. The inevitable clouding of color is referred to as la louche. After a few stiff drinks, this “louching” was likely akin to the modern-day entertainment value of a lava lamp after a Cheech and Chong session. Famous, devout absinthe imbibers such as Wilde, Poe, Picasso, Manet and Van Gogh added to the siren call. Absinthe was their meditative muse. Hemingway made his own modern-day twist by blending imported bootleg absinthe with Champagne; three to five per afternoon was his daily dose. The botanical buzz acts a stimulant that counters alcohol’s depressant properties. This lucid intoxication supposedly allowed intellectuals and artists to put pen to paper and brush to canvas while other high-proof spirits consumed with such zeal would likely have induced a drunken stupor. It was thought that thujone—the active chemical derived from wormwood—gave absinthe its mind-altering and inspiring qualities. Eventually, the temperance movement, anti-alcohol groups and French winemakers attacked the spirit and attributed insane acts, social problems and crimes to its consumption. The final nail in absinthe’s coffin was a highly publicized murder of a family by their father, who had consumed absinthe (the liter of wine and brandy was conveniently omitted from the headlines). Absinthe was first banned in Switzerland in 1910, which was soon followed by a near world-wide absinthe prohibition. Almost 100 years later, science has shed enough light on the mysterious and attractive Green Fairy to warrant a repeal of the ban. No chemical properties of any absinthe— even pre-ban absinthes, which allegedly contained higher levels of thujone—have hallucinating, psychedelic or narcotic effect. Sorry, you’ll have to look to more traditional-style contraband such as “magic” mush rooms or LSD if you really want to see Green Fairies and purple elephants. Louis Koppel is sommelier at Spencer’s Steaks & Chops.